Just recently a three-year-old girl was hospitalized in Florida City after her being viciously attacked by her neighbor’s dog. According to 7 News Miami, the young girl was walking to a convenience store with her father around eight o’clock in the evening when a large mastiff mix attacked her. Apparently the dog escaped from a neighboring yard, lunged at the victim, and continued to bite her for several minutes while the girl’s father and the dog’s owner attempted to stop the attack. The girl was taken to the hospital and the dog has been surrendered to Miami-Dade Animal Services. But what about the dog’s owner? Can he be held legally liable for the attack? In order to answer this question we turn to Florida’s dog bite statute and Dangerous Dog Act. That person is in a public place or is lawfully on private property. It should be noted that under Florida’s dog bite statute a dog owner can be held liable even if the owner did not have former knowledge of the dog’s viciousness. Additionally, the owner can still be held liable even if they took reasonable care to prevent the attack from occurring. However, the statute does note that if the victim acted negligently in some way, and that negligence is a proximate cause of the biting incident, then the dog owner’s liability is reduced by the percentage that the victim’s negligence contributed to the incident. But what if the owner had prior knowledge that their dog was dangerous? Florida’s Dangerous Dog Act (section 767.13 of the Florida Statutes) provides that if a dog owner had prior knowledge of their dog’s dangerous propensities, and demonstrated a reckless disregard for this fact given the circumstances, then the owner may be charged with a second-degree criminal misdemeanor if their dog bites someone. Additionally, if the dog had previously been declared a “dangerous dog” by the animal control authority and attacks someone without provocation then the owner can be charged with a first-degree misdemeanor offense (or even a third-degree felony charge if the attack caused severe injury or death). 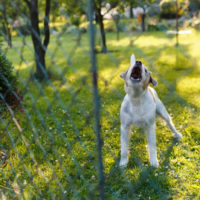 How Does Dog Bite Liability in Florida Differ from Other States? It is important to realize that dog bite liability is largely governed by state law. This means that the dog bite liability laws that operate in Florida may not be the same as the laws that exist in a neighboring state. For example, many other states utilize the “one bite rule”. Under this rule a dog bite victim can essentially only pursue compensation from the dog’s owner if the dog bit someone in the past, or if the owner had been put on notice of their dog’s dangerous propensities in some other way. If you or a loved one has been injured by a dog in Florida you may want to consider filing a personal injury lawsuit in order to recover the compensation that you are legally entitled to. This compensation may include damages for past and future medical expenses, emotional distress, lost income, pain and suffering, etc. To speak with an experienced Florida dog bite attorney contact the Mander Law Group today at (352) 567-0411.